Christian marriage is a gift given by God to God’s people for the well-being of the human family. For Christians marriage is a covenant through which two people are called to live out together before God their lives of discipleship. It is a sacred and holy rite, consecrated by God. Please contact us at 954-523-6472 to schedule an appointment. Our Event Coordinator will assist you in creating the inspiring and heartfelt ceremony of your dreams. We will be happy to work with you to discuss the service and any questions or concerns you may have as a couple as you enter marriage. 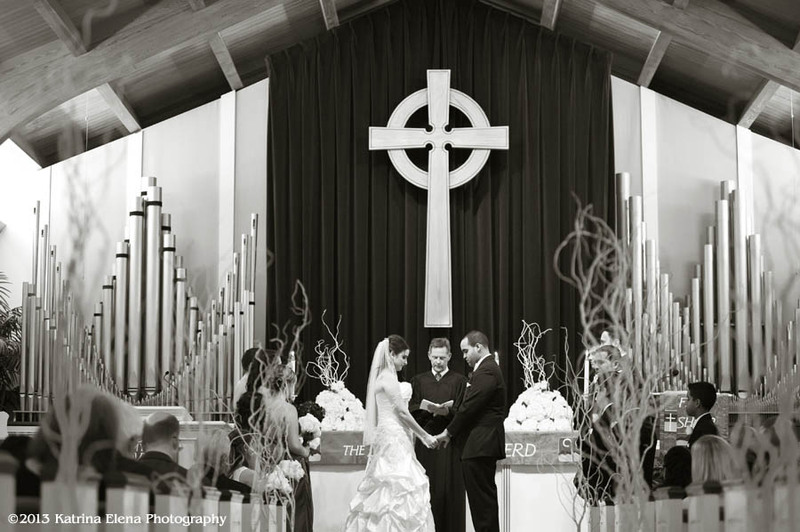 Our Music Director, Christopher Kane, provides the organ music for all wedding ceremonies. He can help you in selecting appropriate music either in person or on the phone and assist you in hiring additional musicians or soloists should you desire them. Mr. Kane must approve all music that will be performed. He can be reached at 954-463-2833. Flowers and other decorations must be fitting both to the nature of the worship service and the sanctuary. Pew decorations may be attached with large rubber bands or ribbons. No tape, thumb tacks, nail, screws, or clamps are permitted. Runners are also not permitted. Flowers will not be able to be delivered and arranged until one hour before the wedding service and should be in place 30 minutes prior to the start. All photographers and videographers must make themselves known to the Pastor and Wedding Coordinator prior to the service and will be required to follow strict guidelines for camera placements. On the day of your wedding, you may have full use of the grounds and the church one hour prior to the ceremony. You may also use the church and grounds for 30 minutes after the service for formal and group photos. Contact the church office at 954-523-6472 to make an appointment to tour the church with our Event Coordinator. To schedule your wedding at The Church By The Sea, you will need to completely fill out a wedding application including the dates and times for both the wedding and the wedding rehearsal. A $500 deposit ($350 non-refundable deposit and a $150 refundable assurance deposit for any damages, or time overages) is required to secure the date on our church calendar and must be included with the wedding application. The remaining balance should be paid no later than two weeks prior to the ceremony. An appointment with the Church Musical Director should also be made to discuss the music for the service. The total fee required is $1750.00 (which includes the $350 non-refundable deposit and the $150 refundable assurance deposit) and includes the services of the Pastor, the Event Coordinator, the Musical Director and use of the facilities. Any additional services, or requests may incur additional fees and will require prior authorization by the Pastor. The church also has a reception space, Eden Hall, which is available for rental and can accommodate up to 120 guests. Our Event Coordinator can assist you in booking your reception in Eden Hall. For more information e-mail us at office@thechurchbythesea.org. Confetti, bird seed, flower petals, or rice may not be thrown inside, or outside of the church. Bubbles are permitted outside the building. All decorations must be removed immediately following the service, so that the church can be prepared for other services that may follow. Rehearsals and weddings must start on time! The latest time a wedding or rehearsal may begin is 5pm. A marriage license issued by the Clerk of the Courts (201 SE 6th St, Fort Lauderdale. Rm#270. 954-831-6600.) must be presented at the time of the rehearsal. Marriage Licenses in Florida are good for 60 days from the date of issue.